* Claverly Maryanne ($179) – I love patent. Love the Maryanne silhouette. Tough one to pass on. It also comes in black and pale grey. * Radcliffe Esti w/bow ($119) – Another one I love. This is just so stinkin’ cute. I think if the bow were patent and not grosgrain, I would’ve caved. Also, the drop on this is 5.5″ which is going to make it tough to keep on the shoulder. Drops from 7.5″ – 9″ are the best for that, imo. The Bowrama Louisa ($119) has a 7″ drop and it looks like the bow on that one is patent. * Pebbled Ace of Spades medium Harmony ($75) – I usually don’t like this type of digital, geometric pattern, but I have the ace of spades print in a zip pouch & like it. This has an open structure, no zip, but I usually keep my contents in zip pouches within the tote. 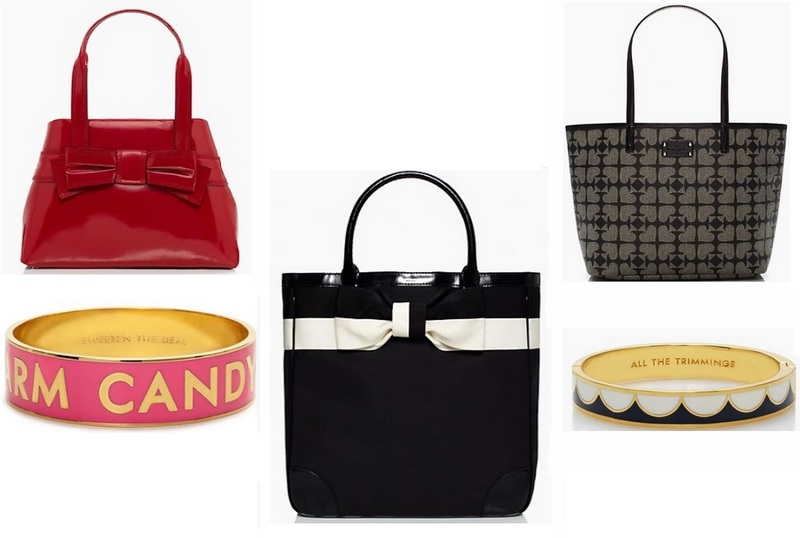 Kate Spade tip: If a style# starts with WKU, it’s Kate Spade Factory. If the style# starts with PXRU, it’s retail. I haven’t had any quality issues with my retail or factory purchased bags. My brother suggested I may like this web site. He used to be entirely right. This put up truly made my day. You cann’t believe just how so much time I had spent for this information! Thank you! I just want to mention I’m newbie to blogs and really enjoyed your web blog. Very likely I’m likely to bookmark your site . You definitely have excellent article content. Many thanks for sharing with us your blog. I simply want to tell you that I’m newbie to blogging and truly enjoyed you’re website. Probably I’m want to bookmark your website . You amazingly come with awesome articles and reviews. Thank you for sharing your web site. I just want to say I am newbie to blogging and absolutely enjoyed your web site. Probably I’m going to bookmark your blog post . You absolutely have good article content. Thanks a lot for sharing your web page. I simply want to tell you that I am new to weblog and really liked this website. More than likely I’m planning to bookmark your site . You absolutely come with remarkable well written articles. Appreciate it for sharing with us your website. I simply want to say I am all new to blogging and really savored your web blog. Very likely I’m planning to bookmark your blog . You definitely have incredible articles and reviews. Thanks a bunch for revealing your web site. I simply want to tell you that I am just very new to weblog and absolutely loved this web page. Very likely I’m want to bookmark your site . You definitely come with fantastic writings. Many thanks for sharing with us your website. I simply want to tell you that I am just newbie to blogs and definitely liked this website. Most likely I’m planning to bookmark your website . You absolutely have really good writings. Regards for sharing your website. I simply want to mention I am just very new to blogging and honestly savored this web page. Almost certainly I’m going to bookmark your website . You definitely come with really good writings. Many thanks for sharing with us your blog site. Great tremendous things here. I¡¦m very satisfied to look your article. Thanks a lot and i am having a look ahead to contact you. Will you please drop me a mail? I just want to say I’m new to weblog and honestly loved your website. Likely I’m planning to bookmark your website . You definitely have outstanding article content. Thank you for sharing with us your blog site. Great awesome things here. I¡¦m very happy to look your article. Thanks so much and i’m having a look forward to touch you. Will you please drop me a mail? I just want to mention I am beginner to blogging and truly savored your web site. Most likely I’m want to bookmark your blog post . You absolutely come with very good articles and reviews. Regards for sharing your blog site. I just want to mention I am very new to weblog and truly savored you’re web page. Most likely I’m want to bookmark your site . You really come with good articles. Thanks a bunch for sharing your web site. Wow, fantastic blog structure! How long have you ever been running a blog for? you make running a blog glance easy. The total look of your site is magnificent, let alone the content material! I will right away take hold of your rss as I can’t find your email subscription link or e-newsletter service. Do you have any? Kindly permit me know in order that I may just subscribe. Thanks. Magnificent goods from you, man. I’ve understand your stuff previous to and you are just extremely great. I actually like what you’ve acquired here, certainly like what you are saying and the way in which you say it. You make it enjoyable and you still care for to keep it smart. I cant wait to read much more from you. This is actually a great website. Magnificent goods from you, man. I have understand your stuff previous to and you’re just extremely great. I really like what you have acquired here, certainly like what you’re stating and the way in which you say it. You make it enjoyable and you still care for to keep it wise. I can’t wait to read far more from you. This is really a tremendous site. Nice post. I was checking constantly this blog and I’m impressed! Very helpful information specially the last part 🙂 I care for such information much. I was looking for this certain info for a very long time. Thank you and good luck. Thank you a bunch for sharing this with all folks you actually recognize what you’re talking about! Bookmarked. Please additionally discuss with my website =). We can have a hyperlink change contract between us! I blog frequently and I genuinely thank you for your information. Your article has really peaked my interest. I’m going to bookmark your website and keep checking for new details about once per week. I subscribed to your RSS feed as well. Right here is the right website for everyone who wishes to find out about this topic. You realize a whole lot its almost tough to argue with you (not that I personally would want to…HaHa). You certainly put a brand new spin on a subject that’s been discussed for many years. Wonderful stuff, just wonderful! Hiya, I am really glad I have found this information. Today bloggers publish just about gossips and internet and this is really annoying. A good web site with interesting content, this is what I need. Thank you for keeping this web site, I will be visiting it. Do you do newsletters? Can not find it. Thanks, I’ve recently been looking for info about this topic for a while and yours is the greatest I’ve came upon so far. However, what about the bottom line? Are you positive in regards to the supply? Hi, I do believe this is a great website. I stumbledupon it 😉 I will revisit yet again since I saved as a favorite it. Money and freedom is the best way to change, may you be rich and continue to help others. Good post. I learn something totally new and challenging on websites I stumbleupon on a daily basis. It’s always useful to read content from other authors and practice something from other websites. I truly love your website.. Very nice colors & theme. Did you create this site yourself? Please reply back as I’m attempting to create my own personal site and would love to know where you got this from or exactly what the theme is called. Appreciate it! Howdy very cool website!! Man .. Beautiful .. Amazing .. I will bookmark your blog and take the feeds also¡KI’m glad to find a lot of useful information here within the submit, we need work out more strategies in this regard, thanks for sharing. . . . . . Merely a smiling visitor here to share the love (:, btw outstanding style and design. “Better by far you should forget and smile than that you should remember and be sad.” by Christina Georgina Rossetti. Hi, I do think your blog could possibly be having web browser compatibility problems. When I look at your website in Safari, it looks fine however, when opening in Internet Explorer, it’s got some overlapping issues. I merely wanted to provide you with a quick heads up! Besides that, wonderful site!